Laws concerning the “divers-down-flag” and the restrictions they impose vary from state to state. The confusion is amplified because divers may trailer their boats to another state, or launch in one state and dive in the waters of another state. The diver or boater may not even be aware of the change. Another area of confusion concerns the traditional red and white divers flag verses the blue and white alpha flag. We will address that, and discuss considerations for what dive flag or dive flag symbol should be displayed. The traditional red & white divers down flag is mandated by state law, and must be displayed in some form anytime divers or snorkelers are in the water (unless in an area designated for swimming only). 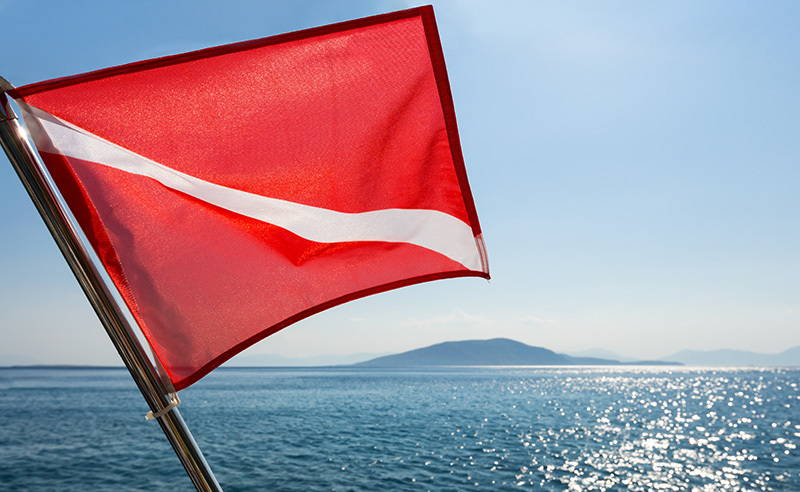 If diving or snorkeling from a boat the dive flag should be displayed from the highest point of the vessel so it is visible from all directions. The minimum size recommended for a dive flag on a vessel 20 x 24 inches. This size also meets the requirements of every gulf state. All dive flags should have a stiffener to keep them horizontal even with no wind. A stiffener is required by most state’s law as well. A dive buoy or float can also be used to display the diver down symbol, and the minimum size requirement is a smaller 12 x 12 inches. However, if displayed from a float it is best to have an arrangement of several “divers down symbols” rather than a dive flag. This is because a flag can be invisible when directly approached “edge on” or in line with the flag. It is therefore better to have a three or four sided flag symbol that can be seen from any approach. In Florida, the law requires a three or four-sided arrangement when a buoy or float is used. This is less of an issue with a dive flag displayed from a vessel because the vessel itself is highly visible and other boats tend to give wider berth to vessels than buoys. 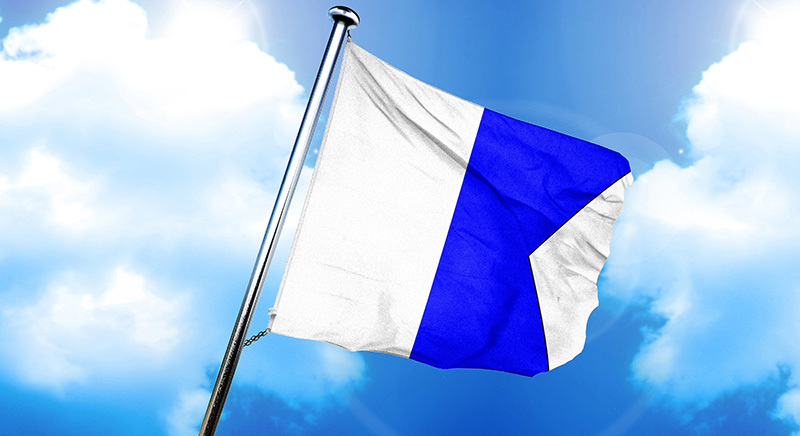 The international flag symbol for “A”, (Alpha flag) is blue and white with a horizontal V cut from the outside edge. This flag is displayed from vessels as a signal to other vessels that for some reason the vessel displaying the alpha flag is stationary and unable to move to avoid collision. One such circumstance is when commercial divers are working from a vessel, usually with lines and hoses from the divers to the vessel. Federal and international maritime law requires the alpha flag to be displayed on vessels when commercial diving operations are being conducted. On a typical dive boat carrying recreational divers it is up to the captain’s discretion as to whether the alpha flag is displayed while divers are in the water. The alpha flag is essentially meaningless when displayed from a buoy. Divers should be in close proximity of their divers down flag or buoy, particularly when on or near the surface. When on or near the surface the distance between a diver and the divers down flag or buoy should be minimal. The exact distance varies by state, but range from 50 to 100 ft. Boat operators are required to stay a minimum of 100 to 200 feet away from the flag or buoy. This also varies by state, but regardless of state law, the best practice is to stay at least 300 feet away when feasible. Divers need to understand that the law does NOT require boats to stay away from a divers down flag, but only that when approaching within the specified distance, the vessel may only proceed with caution and at the minimum speed necessary to maintain steerage. It is best and safest for everyone that vessels try to stay well away from diver down flags and buoys. Divers need to exercise common sense and courtesy when putting up a dive flag. It is unreasonable to pull up right next to a boat already fishing on a spot and then put up a dive flag. Diving activity in the immediate proximity of fishing can alter the fish behavior, and expecting the fishing boat that was there first to alter its activities to accommodate the divers is unreasonable. Divers also need to be aware that the distances vessels are required to stay away is reduced when diving any place other than wide open water. This includes passes or inlets, channels, rivers, etc. Divers do not have the right to impede travel in restricted or high traffic areas. Fishers need to understand that divers are more restricted as to where they can pursue their activity than fishermen are. A small difference in depth can be a major consideration for divers. A difference of a few feet can make a significant difference in a diver’s available time. Visibility is also a big factor in dive site selection, as is the size of the reef. The larger commercial dive boats need to put their divers on a reef with enough room to spread out some, whereas fishers stay within the confines of their boat and can effectively utilize smaller sites. These smaller sites also often hold more fish concentrations than the larger reefs. But these smaller sites are unfeasible for a commercial dive boat with a dozen or more divers, so those operations have a smaller number of choices of sites suitable to take their divers. By using common sense and common courtesy divers and fishers can both enjoy the water safely without infringing on each others good time on the water.